Could teleportation be possible? With quantum computing, information could indeed be teleported, according to two recent videos featuring Wilfrid Laurier University Professor Shohini Ghose. Ghose, a theoretical physicist, was named a TED Senior Fellow in 2018, which gave her the opportunity to deliver a talk from the TED stage. It’s one of many honours she has received, which include being inducted into the prestigious College of New Scholars, Artists and Scientists of the Royal Society of Canada. An outstanding teacher as well as researcher, Ghose has also received a Laurier Faculty of Science Award for Excellence in Teaching. Her ability to make the most complex topics interesting and comprehensible comes to the fore in her November 2018 TED talk, Quantum Computing Explained in 10 Minutes. It was posted online in January 2019 and has been viewed more than 1.3 million times. Ghose also figures prominently in a recent episode of the PBS science documentary series Nova. The episode, Einstein's Quantum Riddle, follows scientists as they try to prove quantum entanglement is real. In both videos, Ghose discusses ways that quantum computers could revolutionize information science because of the ability of quantum bits to shift fluidly between zero and one, or be some combination of both, rather than being one or the other as regular bits are. One of the possible applications is better cryptography, which is the process of securing online data and communication. But if hackers could get hold of quantum computers, they would be able to able to hack any standard, non-quantum cryptography. “A quantum computer could crack our best encryption protocols within minutes, whereas a regular computer or even a super-computing network today couldn’t do it given months of time,” Ghose says in the Nova episode. Even more mind-bending is the possibility of teleporting information from one place to another without physically transmitting it. 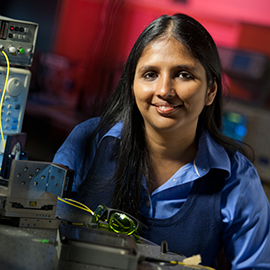 In addition to her quantum research, Ghose is passionate about advocating for diversity in science. She is founding director of the Laurier Centre for Women in Science and is among those around the world celebrating International Day of Women and Girls in Science on Feb. 11.